All of our dogs are Thoroughly Veterinarian Cleared prior to entering our breeding program. They are regularly Vet checked & screened for Optimum Health. They MUST have Great attributes & health before being allowed to be used for breeding. ONLY High potentials are kept for breeding candidates. Genetic Health testing with Careful Match-making to produce the Healthiest Puppies possible! Daisy, Stunning in Beauty, is of champion lines. 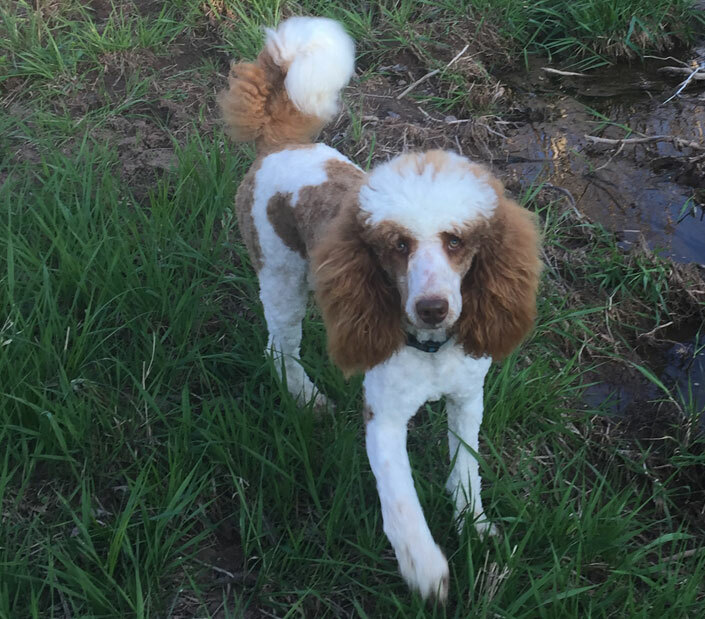 She has perfect genetic clearances via Embark vet and tested positive for low shedding! Ever the sweetest nature, Daisy is loved by all who meet her! 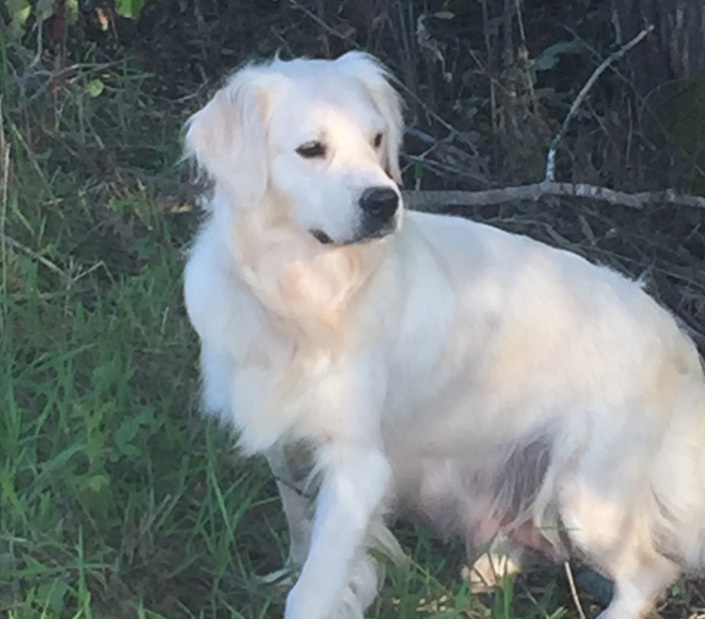 AKC English Cream Golden Retriever, produces puppies of Amazing Beauty! Weight 52-60 pounds. Daisy is an AKC English Cream Golden Retriever Puppy Mom! Beautiful Bloodlines from Spain, Rome, Hungary. Duchess is a sister to Daisy & our smallest of the English Creams at about 18 inches/46 pounds. She is the all-time SWEETEST CALMEST & MOST QUIET Dog people have ever met! AKC Champion lines English Cream Golden Retriever Genetic Health Clearances through Embark Also carries for both Typical and Atypical Goldendoodle Coats! Her Puppies are calm, intelligent & decidedly 'Teddy Bears'! Bloodlines from Spain, Rome, Hungary. Buck, growing more Gorgeous every day, traveled to us & the Great North from the Hidden Springs of Tennessee. His SPECIFIC lines were Carefully selected after searching the country over. Not the WHOLE country over, was found SUCH a Gorgeous Match with SUCH PERFECT GENETIC/OFA Clearances! BOTH parents have Amazing OFA Clearances of the Hips, Elbows, Heart & Eyes. When we say 'Elite', it is important to note that, Elite does not come easy. Elite in Beauty, Temperament, & Health is the True goal which makes them... Elite. Buck's Parents are of Amazing Champion Show Bloodlines and are Direct Serbian Imports. Genetic Clearances Via Parentage for all Genetic Conditions that affect Golden Retrievers. 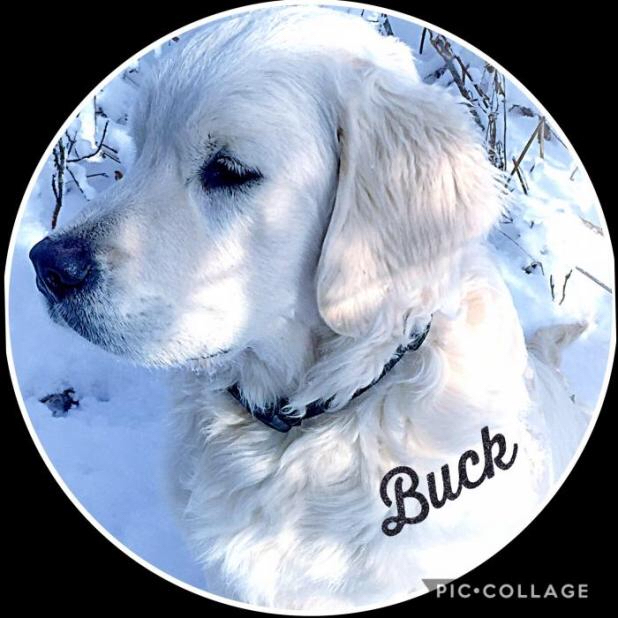 Buck's Parents' weight ranges 60-80 pounds. Jason's personal favorite - Bird Hunting lines & is from Minnesota. 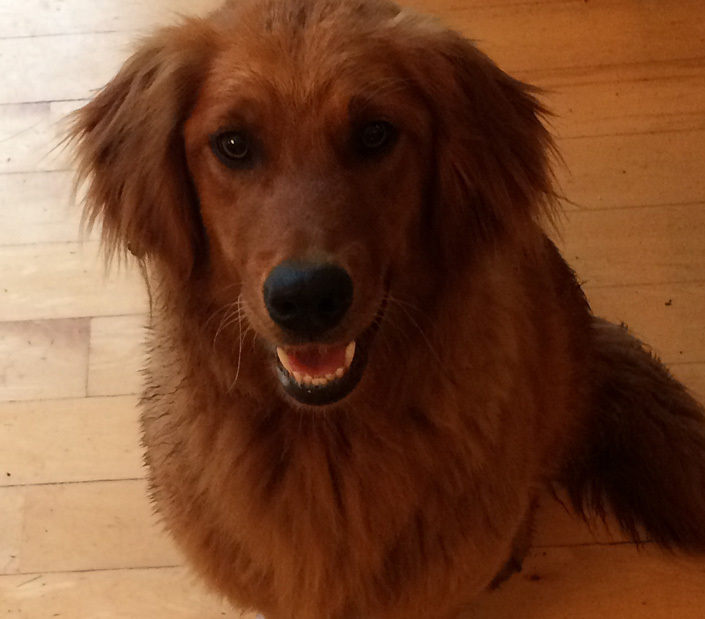 AKC Golden Retriever Genetic Health Clearances via Embark. She is amazing in nature, quick, & phenomenal at parenting. She produces simply stunning Dark Red Goldendoodle puppies, & carries for both Short (Atypical/Golden Retriever Look) & Long Haired (Typical/Goldendoodle Teddy Bear Look) Goldendoodles! Bailey is a Goldendoodle Mom! Bailey's weight ranges between 45-49 pounds. Some of her puppies have gotten bigger than her. Full AKC Champion lines Genetically clear for PRA, NE, vWD & more Genetic Clearances through Embark. A quick, manly disposition (despite his smaller size), Lincoln is extremely gentle with the Ladies, all puppies, & all people! He produces amazingly intelligent puppies with gorgeous coats! His Embark DNA test estimates his adult size to be 49#. He is a wonder Guy in a smaller package :) Lincoln is from the Beautiful State of Idaho. Embark is the most powerful dog DNA test on the market, using research-grade canine genetic testing. Other dog DNA tests only look at 30-2,000 variants, giving you less accurate or incomplete results. Embark’s dog DNA test uses research-grade technology to test over 20x the genetic information than other dog DNA tests. Embark uses over 200K genetic markers and screens for over 200 dog breeds to tell you the makeup of your pup. Embark’s top canine DNA scientists run over 175 genetic health tests on your dog.